I know I haven’t posted a photo of myself since the one I took on July 4, but before you get excited from a quick glance at the photo above, let remind you of what I actually look like because that one is not me. It’s one I pulled off the internet because the model is demonstrating one of the positions I’ve spent a lot of the summer in while on a spin bike at the gym. The pictures below are me. I took them after my class today and shows you what I meant when I wrote about Spinning for England. They’re not pretty, but who needs pretty when you finish a class feeling strong and fit. When I realized back in early June that I might be stuck in the US for a while and after I had eaten my way through three, that’s right, three pints of my favorite Hagen Daz ice cream flavors and three 1/2 gallons of Bryers, (ice cream sales seem to always be based on buying three) I decided that I was going to need an outlet other than sugar and salt combinations to survive my extended stay in Atlanta. Finding a gym within walking/running distance to my downtown house was important as I didn’t have a car this summer except when my friends, Carla and David, loaned me their cars while away on trips. It’s been a long hot summer with temperatures staying in the mid to high 90s making indoor exercise necessary. I’ve been run/walking to the gym to spin most days (5 to 6 a week) since early June and while it’s only about 1.7 miles away, covering a distance of about 3.4 miles on foot in addition to spinning for an hour has begun to show some results. I still weigh more than I did when I met John in early 2008 and most people here don’t seem to have noticed the change in my size. It’s not dramatic like someone who loses a noticeable amount, but I can see it and what’s more, I can feel it. I’m down 17 lbs as of this morning and trying to make it 20 before I fly home next week. I won’t be too bothered if I don’t get to 20 as I can tell I’ve lost inches from working out, but it would be nice to make it an even 20 lbs. Earlier in the year I was moaning about wanting to get fit and how I wanted to wear my shirts tucked in again even though it was not in fashion. From what I can see it’s still not in fashion, but guess what I did last Friday … yep, I wore my shirt tucked in! Since I’m short-waisted, tucked in has never my best look even when I was thinner, but it felt great to do it and the best part was knowing I had a choice. Now if I can just remember that bit about choices when I head for home next week, particularly when there’s no spin class down the street and the sausage, egg, and chips, combo calls to me from the pub menu on quiz night. In or out, fit or fat, yes or no … during my season away in what I alluded to as my ‘Summer of Lost and Found’, one thing I’ve discovered is that moderation in some areas of life makes me happier. I’ve still eaten the foods I enjoy without guilt, but I’ve paid more attention to why I want something and how much I really need to feel full. Combined with exercise this easy approach has been manageable and has not left me feeling deprived in any way. This morning my new ride showed up at the door. Thanks to the Christmas generosity of my step-mom Cullene, I have a new way to try to fight the steady diet of carbs, carbs, and more carbs that I tend to indulge in since moving to Cornwall. 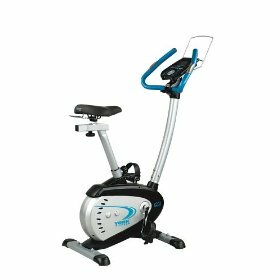 I thought this exercise bike might help balance my inability to walk past a plate of eggs, sausage, and chips, better known as french fries in America. My will power seems to have evaporated since my hip pain became an issue and I need a little something to get me moving again. I decided after a good bit of research to not have the hip surgery that I mentioned in several previous posts. The recovery was so long and people who went through it still appear to have a fair degree of pain along with a limited range of motion and I just could not convince myself to risk those odds. While I am generally an adventurous, risk taking kind of person, I felt like my inner voice was saying no … don’t do it and at my age I’ve learned to listen to that voice. With surgery ruled out, I decided to readjust my running (not give it up) and bring in a few more fitness options that won’t stress my hip quite so much. Now I just need learn how to say no more often when John asks me, ” Do you fancy sausages tonight? ” because everyone knows that sausages taste infinitely better with a side of chips.